(Portland, Oregon) - A magnitude 8.2 quake hit off the coast of Chile today, causing large-scale evacuations of several coastline areas of not just Chile but other South American shorelines. The possibility of tsunamis of an unusually destructive power does exist in South America, and thus the state of Hawaii is being looked at to some degree. Currently, data indicates there is no danger to Hawaii, but there are still a few hours before scientists will know how large any wave will turn out to be. “A destructive Pacific-wide tsunami is not expected and there is no tsunami threat to Hawaii,” the USGS said. The USGS then repeated the message. The west coast of the U.S. is also being looked at to a smaller degree. The USGS said a tsunami has been generated that could potentially impact the U.S. west coast, British Columbia, or Alaska. This is not expected however. The U.S. National Tsunami Warning Center is analyzing the event to determine the level of danger, and more information will be issued as it becomes available. 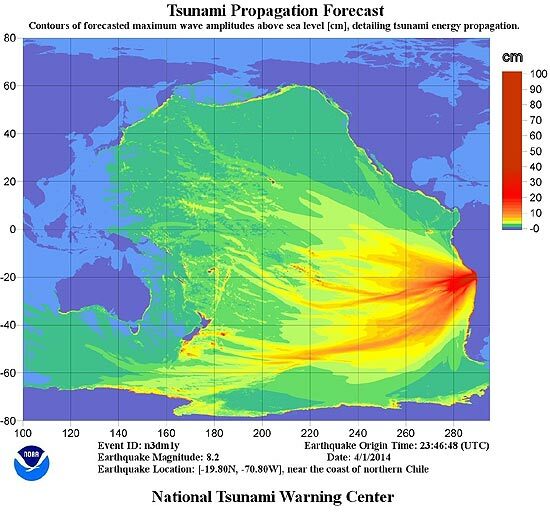 This earthquake has the potential to generate a destructive tsunami in the source region. The USGS called that an information statement, "which indicates that an earthquake has occurred, but does not pose a tsunami threat, or that a tsunami warning, advisory, or watch has been issued for another section of the ocean." Keep an eye on any developments for Oregon or the west coast at \ Live Earthquake, Tsunami Updates from Oregon Coast, Washington. B.C., California, Alaska. Direct information from NOAA regarding Hawaii is here.